Hope your weekend was as interesting as ours! 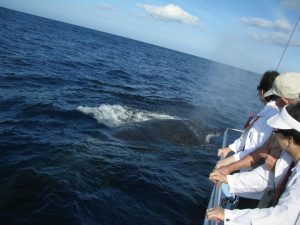 Guests on Friday’s Wake up with the Whales Cruise saw spouts, dorsal fins, and/or flukes from more than a dozen whales. We got to watch a couple of very tiny calves diving around their moms, and watch a large lone Humpback lift his flukes as he dove. Seconds after he sounded we could hear his song reverberating through the hulls of the boat so he must have been right underneath us (no hydrophone necessary that time). We also got to see another lone whale do a single pec slap, and some of us saw the splash from a breach on the horizon (though we weren’t sure if that counted as a sighting since it was so far away). We began Saturday’s Wake up with the Whales Cruise triangulating between sightings of a pair of Humpbacks, and two lone Humpbacks. Later in the cruise we were approached by what we thought was a solo whale. He headed right towards the boat, and spouted and sounded about 30 yards off our bow. A couple of minutes later he surfaced again even closer to our bow…and then sounded and showed up at our stern. The next time we saw him was right off our starboard rail, at which point we realized he was accompanied by another whale. The two of them circled us, sounding at our stern, and then swam under the boat (our depth finder went from 195′ to 45′ as they passed underneath). We’re not sure why they were so interested in checking us out, but we’re sure glad they were! On the way to our snorkel site during Saturday’s Snorkel and Whale Watch Adventure Cruise we saw lots of commotion out towards the horizon. Before we could get to it though, we saw a closer spout. We got to the area where we thought that whale was, and after waiting around for a bit, were rewarded when he surfaced maybe 30 yards from us. After watching him, we tried to head out to our far-away whales, but again, we got side-tracked by a closer whale who disappeared, only to surface maybe 30 feet from our stern. A few minutes after he sounded, two whales surfaced 50 yards from our bow, and then sounded again, showing us their big beautiful flukes. On Sunday’s Wake up with the Whales Cruise we saw about 10 different Humpbacks, but the highlight of the morning was watching a very active competitive pod of 3 whales, who were eventually joined by 3 more. These whales were charging all over the place, head lunging and trumpeting as they struggled to catch their breaths. We even got to see a spy hop, and a full breach just 50 yards from the boat. On Sunday’s Mid-Morning Cruise we saw just one whale breaching…and he was far away. That wasn’t good enough for us, so we called it a “Fluke” and invited everyone back with us again for another Whale Watch Cruise for FREE! Ocean Sports Whale Fact of the Day: Research suggests that most Humpbacks who come to Hawaii don’t spend the entire winter with us. An average stay lasts between a month and 6 weeks. Possible exceptions to this rule include dominant males, who may spend more time here to optimize mating opportunities, and females who give birth after arriving in Hawaii. They might spend a little longer here so that their calves can grow large enough to successfully swim back to Alaska.